As a busy mother of 3 I sometimes find it hard to put myself before everybody else in my crazy little household of fun! But, as the youngest of our brood starts to become a tad more independent, I am finally finding the time to concentrate on myself a little more and to re-discover a trickle of that individuality and personality, which lies in wait screaming out more than just "MOM!" With this in mind, it is my pleasure to have had the chance over the past week or so to try out some wonderful make-up pieces from the fabulous Mía Mariú - a health and beauty based company with many enticing products to make you look and feel your best at any time - day or night! Now, As a huge fan of pink lipstick, who also adores a glossy lip, I feel as though the 'Stick Gloss' and I were just meant to be! The rich shade of pink with a buttery, balmy, delicious feel (and a little twinkle) looks like a lipstick, applies like a lipstick, but feels like a gloss and a regular lipstick rolled into one big happy application of lip heaven! 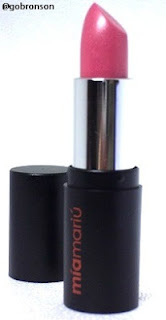 It did not chap my lips, it did not flake and it remained bold and visible throughout the day, which is everything you could ask for in a lip product! The 'Mineral Shadow Liner' is just as divine and serves a multi-purpose! You can, as I did, lightly dust your eyes with it OR you can wet it ever so slightly and apply it as a liner! 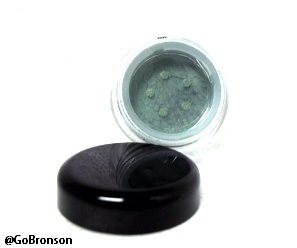 It glides on smooth and gives a rather even dusting to your eye with a little sparkle. 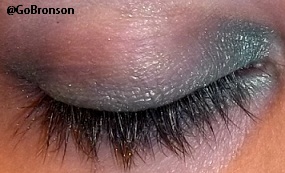 The color is very subtle with one application but can be very dramatic when applied as a liner too! I paired this with a touch of pink and ivory from another collection for a subtle look with a slight edge. I then finished off the eye with the 'Intense Eye Liner', which I am incredibly impressed with! 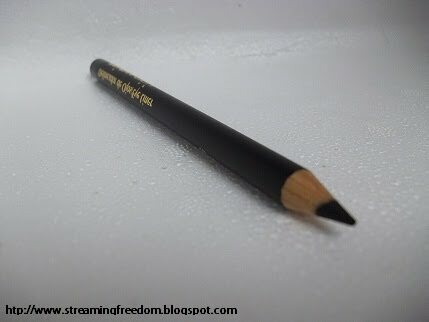 The liner glides on smooth and effortlessly, leaving behind a very fluid line and a very crisp, precise, application which only required one slight touch up throughout the day and did not smudge (or run) at all, even through the rain. Wonderful! My overall impression of Mía Mariú, based on the items in this review, is one of utter adoration! The Aguamarina coloring of the eye pairs exceptionally well with the Beso coloring of the lip, for a light and playful look, which could be worn for almost every occasion. Not too heavy or light, sticky or flaky, patchy or short-lasting, I simply can not find a single fault with these quality products and very much look forward to experimenting with other colors in their range in the near future! Find out more about Mía Mariú? If you would like to know more about Mía Mariú then head on over to their website, which you can find by clicking HERE! Want to WIN Mía Mariú? The generous folks over at Mía Mariú would like to offer one of our lucky readers the chance to win all 3 of the items featured in this review! The winner will receive one 'Hydrating Stick Gloss', one 'Loose Mineral Shadow Liner' and one 'Intense Eye-liner' - The winner can choose the color they would like for the gloss and the shadow, and the eyeliner will arrive in black! This is a wonderful prize valued at an amazing $40! Entering for this giveaway could not be simpler! All you have to do for a chance to win is to reside in the United States, open up the rafflecopter at the bottom of this post (give it a moment to load if you do not see it right away) and click the required entries, of which there are JUST 5! Simply "like" Mom's Gone Bronson and Mía Mariú over at Facebook, "follow" both @GoBronson and @Mia_Mariu on Twitter and then leave us a blog comment letting us know which make-up item you simply could not live without if you had to choose just one! For extra bonus entries you can also tweet about this giveaway once a day until the contest ends! The more you tweet, the more entries you stack up and the more chances you have to win! This giveaway will run from 9/28/12 and will conclude on 10/8/12 at which point the winner will be contacted via email and have 48 hours to claim their prize, so please enter with a valid email address so we can get a hold of you! I would like to thank Mía Mariú for sponsoring this fabulous giveaway and would like to wish all entrants the very best of luck! a Rafflecopter giveaway **Disclaimer - I am in no way associated with Mía Mariú and was not monetarily compensated for this review. I was, however, provided with the products you see pictured in the review. All opinions are my own and and have not been influenced in any way, shape or form by these provisions. Mom's Gone Bronson is NOT responsibly for the fulfillment of the prizes offered in this review, that responsibility lies with the company providing them. MGB will, however, do everything in their power to communicate with the company on your behalf should any problems occur! Good luck! BTW, you did a great job on the makeup(and the photos) and you are so gorgeous. Great review. Wonderful Review!! Thank you for sharing! Love Mia Mariu and LOVE these colors!! You did a great job applying, and the review was very detailed and informative. Thanks! I would say probably Mascara!